2P START! Live! 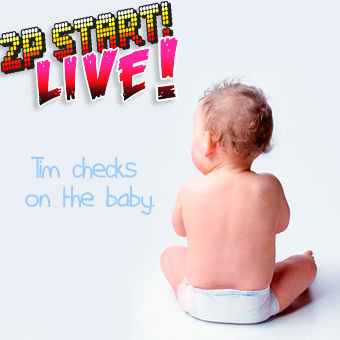 : Tim's Back Edition | 2P START! 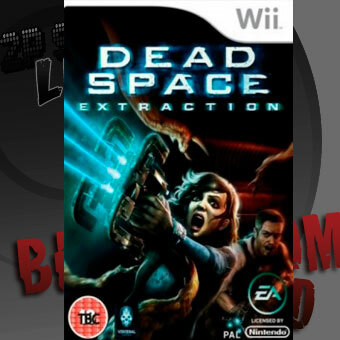 In this episode, you’ll hear: unbelievably ridiculous Wii bundles, a new segment Ray wasn’t expecting, why a Wii-HD looks more reasonable, how Tim’s life makes metaphorical sense for the cover of Dead Space: Extraction, and Ray creates a great first impression……. Yeah, not too much to say about this. 2. 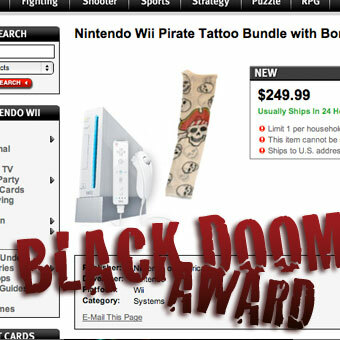 Hilarious Wii bundles. I feel for the person that had to make the descriptions sound interesting. Sounds pretty awesome. I’d love to contribute, though as of now, I can’t really think of anything TO contribute. Oh well. Great Podcast! I loved the new checking on the baby section. I hope we get a lot more of that in the future. I can’t wait for all the lawsuits to come in of people getting electrocuted when playing their wii in their bathtub with their ducky friend. Okay time for the stupidest comment ever. I spent a while looking at the blue part in the podcast pic, because for some reason, the way it’s put together…it looks like a woman. XD No offense to anyone, but seriously. The blank space at the top looks like a bandanna or something like that, while Tim’s open mouth look like lips with lipstick, and his phone looks like an earring. dude. i was so hungry for this podcast. it was delicious. thanks. Actually, that was me making some strange noise….. you can tell because of its echo in connection to when I introduce the segment. Really? Because it sounds EXACTLY like an item being thrown. 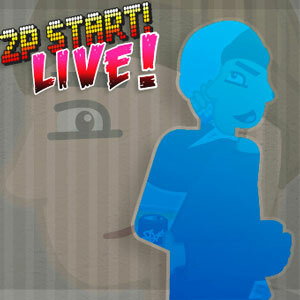 That is the creepiest opening images for a 2P Start podcast I’ve ever seen. At first I thought the blue image was supposed to be Sarah pregnant, but then I saw like, a fist. Then I realized Tim was standing in the background on his cell phone, and then it dawned on me it was just Tim holding a Dr. Pepper. Seriously, what possessed you to do that. Tim inside an outline of Tim… in a house wallpapered with Tim. >__>, that’s just creepy dude, are you sure you’re not gay? At first I thought the blue image was supposed to be Sarah pregnant, but then I saw like, a fist. Then I realized Tim was standing in the background on his cell phone, and then it dawned on me it was just Tim holding a Dr. Pepper. I’M NOT INSANE!! XD No particular woman came to mind, but I thought it looked like a woman. Well actually I thought it might be some weird idea of what Lily might look like when she got older…and that’s especially why I thought it was so odd. When I told (essentially) the same crack joke at Gamestop, the dudes broke out in a fit! I stopped playing the “Punch-Out! !” (yes, the exclamations are necessary) and kiosk and that it was like crack. Then they laughed and asked how I could conceive how addicting it is and if I knew what it was. I thought they were crazy, but then I remembered that I’m 14. Of course. Read what I said last. Yay! Tim’s back! I was a little worried that there wasn’t going to be a podcast this week because it was getting a little late. 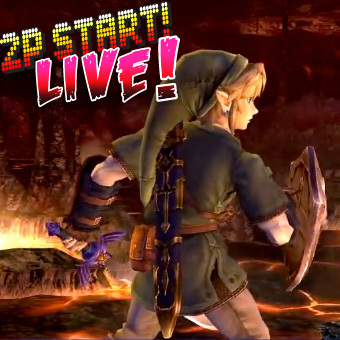 A Wii emulator with better graphics than the actual Wii? Impressive. I doubt that I’ll use this, but it’s very cool that it’s being made. Great BDAs this week. I loved that guy’s 10/10 review of the rubber ducky Wii. The Dead Space cover is hilarious to me, espicially after visiting Joystiq. Every picture they had on each article had that face in it in some way or another (on some character’s head, hidden in a small corner of the picture, etc.). Oh yeah, and Ray and or Tim, do you have any idea why it takes a while for the podcasts to appear in the iTunes store? Am I the only one thinking that the singer in the Music Misfits song sounds like the singer from Sonic R? Some music from SNES! I kinda just picked out games first and then picked good songs from them. You are very welcome good sirs. Another great podcast and I like the new segment as well. Nice that you remembered me! Good podcast all around. Keep up the good work. Yay. Skype call-ins would be fun. Although… I’m not sure about questions, but some of us fans would love to call in ^^. I best get to call in guys, I am yo numba one fan! lol great podcast guys! 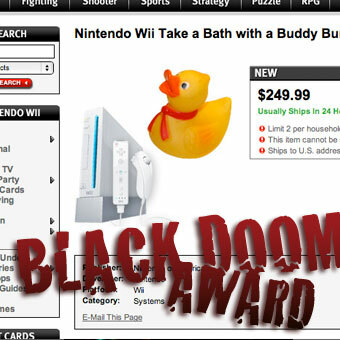 Tim built the anticipation on his Black Doom Award pretty high, yet I completely cracked up when he announced the ‘Bath with your Buddy’ bundle. I would’ve ROFL but I was driving. And hooray for Yoshi’s Story music! I believe it is same artist (Richard Jacques) as well as the same vocalist. Alright, I’m back to commenting on podcasts. Haven’t had time to listen to one since E3 but I’m here now. Man, that is what Zelda should have been. I was replaying Twilight Princess and it just feels sooo last-gen. If it had at least looked like that, it would’ve been a lot better for me. Oh, and voice acting. Oh, I know C-Sections are tedious. I was actually born through one (that’s an awkward sentence to phrase). You enjoyed Transformers 2????!!!??? I cry. Out of curiosity, why is it still called “Suggestion Box”? Have you ever taken advice from a commenter? Tim! You’ve been practicing on your scary voice. I can tell Lily will have a good childhood. (Deep voice) Take out the garbage! (/Deep voice). Thank you Ray! Even though it won’t stop my purchase at all, but I’m still upset. LAN parties are so much fun and everything runs so smoothly. Blizzard really lost some respect on this one (not that it really hurts them, they’re through the roof). Can you even call those bundles?? It sounds like an employee went to his little brother’s birthday party and grabbed one of the party bags. Oh, I missed the banter. Although… I’m not sure about questions, but some of us fans would love to call in ^^. Yeah, because I was thinking that we could just post questions. But the ability to call in is, in fact, very awesome. Just cause nobody has mentioned it yet, I thought I might chime in with a couple of reasons why people keep umbilical cords, in response to Ray’s “why would anyone do that?” query. Though I admit, putting it in a scrapbook hadn’t ocurred to me, though apparently it is meant to bring good luck in some cultures. The current reason for the trend though is the saving of cord blood in a cord blood bank. Cord blood is the primo source of stem cells, for that particular baby, and thus comes in handy for all those procedures that require a blood match to work. Bone marrow transplants being the typical example. But if you’re thinking that saving the cord is gross, then I guess no one has mentioned what some people do with the placenta. Until now. 1. I am disappointed that Starcraft II wont have Lan, because I don’t really enjoy playing games over the internet. I like to be in the same room as my opponents, and I don’t know if my internet can handle several people playing Starcraft II. But the biggest problem I have with this is that this means in order to play Starcraft 2 you will need to use battle net 2, which is a subscription service. The game will not be multiplayer unless you are willing to pay extra money beyond the box price of the game. This is probably a deal breaker for me. I doubt I buy this game now. I am willing to make a decent size one time payment for a game I want, but I don’t have the money to pay for subscription services like battle net 2. 2. Nintendo is insane. I am tempted to believe that the bundles are simply some sort of hoax, but I know they are not. 3. Congrats on the healthy baby, Tim. 4. The music in the checking on the baby section was fantastic. Quick question for Ray: How do you go about choosing music for the background in your podcast? do you have a procedure, or do you just randomly listen to songs until you find one that works? 5. I am going to get the Wii emulator and test it side by side with my real Wii on the same monitor for a better comparison. I’ll let you know what I think. Just wanted to let you know we are thinking about getting a dog. It is a smaller creature, so as not to overpower Logan. My wife is really excited and can’t wait to have it. Thought you might like to know. And good to have you back Tim. A lot of people have done the Mega Man can’t shoot up comic, but that’s not entirely what I meant by my first part of that comment. By “This is a joke that other webcomics would make” I meant that the humor was a little weaker than I’m used to from you. Loved the Black Doom as usual, guys! Especially Tim’s! It’s one I had already heard about, but you guys always manage to make it twice as funny. But the biggest problem I have with this is that this means in order to play Starcraft 2 you will need to use battle net 2, which is a subscription service. The game will not be multiplayer unless you are willing to pay extra money beyond the box price of the game. No its not. Battle.net is the same service for online multiplayer for all of Blizzard’s other games. For example, I already have my account for WC3 because I do a lot DotA, but its no additional fee. What it does do, however, is make you put in your serial number for your copy of SC2 and once you do, no one else can use it online. Its basically DRM, because instead of borrowing your friends disc and stealing a serial number online so you can play LAN, Blizzard has made it so anyone playing multiplayer is using their own purchased copy. HA HA HA! 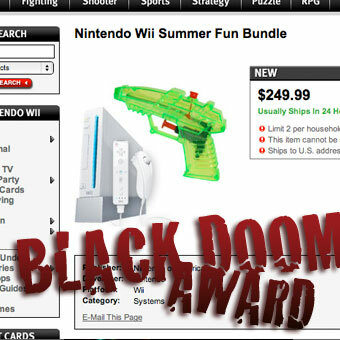 That last part with the wii bundles made me laugh so hard! Soon, they will probably start selling wiis with toothpicks! For a while it was suggested (by Blizzard) that battle net 2.0 would work off of a subscription based business model. More recently, Blizzard has stated that both people who buy Diablo III and Star Craft II at retail will be able to use battle net 2.0 free of charge to play the game multiplayer. However, Blizzard is still looking for ways to make additional money off of additional feautures that are not “core to the game experience.” Don’t know what they mean by that. It looks like I was working off of outdated information. However, Blizzard is still looking for ways to make additional money off of additional feautures that are not “core to the game experience.” Don’t know what they mean by that. Sounds like DLC to me. Probably, but they might also be doing other things, like how a name change in WoW costs money. Quick question for Ray: How do you go about choosing music for the background in your podcast? do you have a procedure, or do you just randomly listen to songs until you find one that works? I’ll have a certain style I know I need to fill, and generally have a few songs in mind. So I’ll listen to them and find one that fits the humor of it all the best. Other times I’ll design segments or moments around a specific song. Such as the Chicken Grab. Okay, something I just noticed. It’s not really a big deal, but I thought I should point it out. The first musical misfit I posted (The Tallon Overworld one) is actually supposed to end at around 3:53. It appears that the person who posted that recorded it in-game. I have the actual Metroid Prime soundtrack and that’s where the track ends on the CD. A minor detail, but one I just thought to point out. If you guys are gonna do a live skype podcast be prepared for serious lag, and a nightmare when you try to edit it. NPG, but where’s “Catch the Chickens”? its like there trying to win the Black Doom award. Nope Star Craft 2 will be hacked so you can LAN play. Something you will never have to do with LttP. Your M4A podcast is really really small image this week. You might want to fix that. These old episodes are the only way we can get our fix. And so I can skip the Musical Misfit. I don’t like having to listen to it while waiting for the bonus segment.